49 South Clerk St, EH8 9NZ. 0131 668 3737, peckhams.co.uk. Mon-Sat 8am-10pm, Sun 9am-10pm. 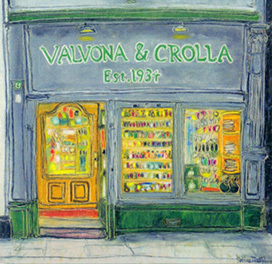 Valvona & Crolla, 19 Elm Row, EH7 4AA. 0131 556 6066, valvonacrolla.co.uk. Mon- Thu 8.30am-5.30pm, Fri & Sat 8am-6pm, Sun 10.30am-3.30pm. Cheesee Peasee. 01875 340912, cheesee-peasee.com. Check website for details and latest timetable. John Bain & Son, 2 Stenhouse Cross, EH11 3JY. 0131 443 3177, johnbainedinburghltd.co.uk. Tue-Fri 8am-4.30pm, Sat 7am-1.30pm. Fudge Kitchen, 30 High St, Royal Mile, EH1 1TB. 0131 558 1517, fudgekitchen.co.uk. Daily 10am-6pm. Choco-Latte, 39 South Clerk St, EH8 9NZ. 0131 667 0091, choco-latte.co.uk. Mon-Fri 10am-6pm, Sat & Sun 10am-6.30pm.